A gritty four-set doubles win by Lleyton Hewitt and John Peers puts Australia at 1-2 going into Sunday's reverse singles rubbers in its Davis Cup tie against Austria in Graz. 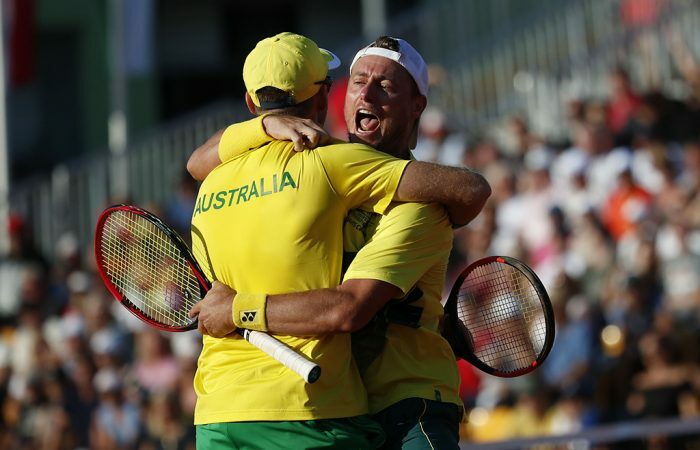 A masterful performance in the doubles rubber by Lleyton Hewitt and John Peers has kept Australia in the hunt in its Davis Cup World Group Play-off tie against Austria. Facing reigning Australian Open champion Oliver Marach and former world No.8 Jurgen Melzer, Hewitt and Peers combined beautifully to record a 6-1 6-4 3-6 7-5 victory on the red clay of Graz. 🇦🇺 @lleytonhewitt and @johnwpeers defeat Marach/Melzer 61 64 36 75 to keep Australian hopes alive!! 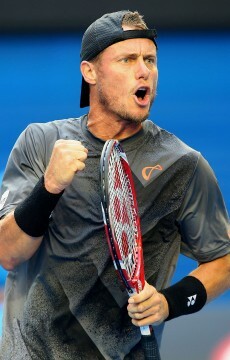 “This is Davis Cup doubles,” Hewitt said. “This is what it’s meant to be – it’s meant to be on the middle day, it’s meant to be best-of-five sets and we’re playing in a tough place, away from home, on a tough clay court. And you build team culture and camaraderie from these types of wins. After losing both singles rubbers on the opening day’s play, Australia now trails 1-2 going into Sunday’s reverse singles matches. Hewitt replaced Thompson on the doubles court and showed his mettle, returning exceptionally throughout the match to keep the Austrians on the back foot. Combined with Peers’ powerful, varied serving, the duo formed an impregnable combination. “It’s amazing. He’s a legend not only of Australian tennis but tennis in general. The energy he brings to the court is just second to none and it’s just so much fun to play with him,” Peers said. In less than an hour they led by two sets to love, while Marach in particular struggled with his timing and movement and required a courtside medical timeout. The only lapse for the Australians came in the third set, where they fell behind 3-0 and failed to convert any of their eight break points in a dramatic fifth game featuring 11 deuces. But deep into the competitive fourth set, Hewitt and Peers found another gear. “I thought we played a really good level,” Peers said. Hewitt’s returns were at their laser-like best in the closing stages, and when he hit a volley winner in the 12th game he and Peers had arrived at match point. Peers converted it with a stinging forehand return winner into the doubles alley. “That’s all we could do today – couldn’t do much more,” said Hewitt, when asked how the Aussie team was placed at this stage of the tie. “It’s gonna be a very tough ask again tomorrow but all my boys will prepare as well as possible and we’ll do absolutely everything we can and we’ll leave it all out here.